'Gesundheit' (Charles Bunnell, R. 2011) Seedling #Q110-1. MTB, 20-22 (5136 cm), Early midseason bloom. 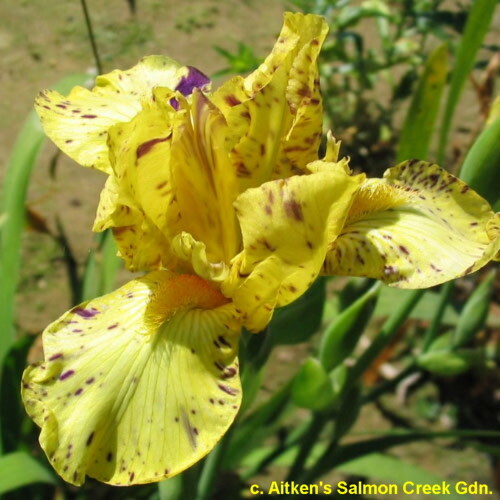 Standards and style arms bright yellow, irregular purple specks; falls slightly lighter yellow, random small purple streaks; beards bright yellow. Seedling #H25-1: (seedling #D45-1: ('Lucky Mistake' x 'Zebra') x seedling #C39-12: ('Welch's Reward' x unknown)) X 'Opal Imp'. Aitken's Salmon Creek 2012. Honorable Mention 2014, Award of Merit 2017.
jpg BHP_5690-X2_gesundheit.jpg manage 68 K 21 Feb 2016 - 05:00 BrockHeilman Please contact Brock Heilman for image use.